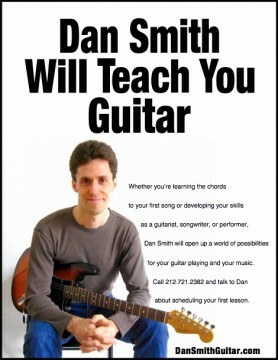 Dan Smith, a lone guitar player who wanted to make a living off teaching music lessons, has become a New York marketing legend in his own right. But Dan Smith didn’t do ANYTHING fancy. His flier? Couldn’t be more basic. Even his name – Dan Smith? Not exactly a rarity. Yet his simple strategy blew away his competitors. He then posted his fliers around town so regularly, for s uch a long period of time, that complete strangers began recognizing him. Before too long, he had something of a cult following. (Google or google image him and you’ll pick up on this.) This frenzy has only been furthered by the fact that John Mayer recently copied his flier. The result? People are standing in line to drop $100 per lesson from Dan. 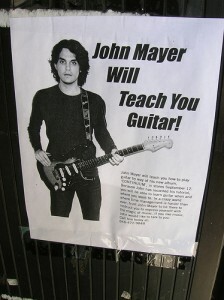 In fact, he gets so much business now, he barely has time to keep posting the fliers that gave him his standout reputation. Keeping it simple is straight up Dan Smith. And nobody can beat Dan Smith at being Dan Smith. What about you? What is straight up YOU? Maybe you’re not the design simpleton that Dan Smith is. That’s fine. But if you’re not, don’t force yourself into his gig. BE YOU. Do your projects and brands reflect YOU? Because nobody can out-you you. I love this question because–it’s the monsters I crochet. I started making them to use up the yarn I had laying around and wasn’t going to use for a more productive project. Then I posted pictures on Facebook. Everyone fell in love, everyone wants one, my mom took one to work to scare her coworkers. Now I get requests faster than I can fill them and my original creation has his own fan club on Facebook. WITH FOURTEEN MEMBERS!